Coming up we’ll hear from Axel Merk, President and Chief Investment Officer of Merk Investments and manager of the Merk Funds. Axel breaks down investor complacency, the risk of putting too much money into risk assets and gives advice on the proper weighting of precious metals in your own portfolio. 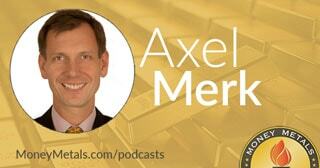 Don’t miss a sensational interview with Axel Merk, coming up after this week’s market update. Precious metals markets saw a bit of a relief rally this week off deeply depressed sentiment. The silver futures markets entered trading Monday with a record high in non-commercial speculative short positions. That’s often a contrarian indicator which suggests bearish sentiment has gotten excessive. The extreme silver short position doesn’t necessarily mean a major bottom in silver prices is in. But it does indicate that a rally of at least some significance is likely to unfold soon. In a bullish scenario, the rally could turn into a massive price spike fueled by traders covering their short positions. Last week’s technical breakdown may have generated maximum pessimism in the silver market. That is usually followed by capitulation and short covering. We’re already seeing some of that today, with gold and silver rallying on news of lower-than-expected readings on retail sales, consumer sentiment, and consumer price inflation. Markets may be thinking the Fed will have trouble hiking interest rates any more this year. Silver is now posting a weekly gain of 2.0% to bring spot prices to $16.01 an ounce. Gold prices are up 1.2% this week to trade at $1,228. Platinum comes in at $920, higher by 0.9%, while palladium is higher by an impressive 1.9% this week and now trades at $861 per ounce. Palladium is now within striking distance of trading at a 1 to 1 ratio with platinum. That hasn’t happened since 2001. Palladium still has the positive momentum, but platinum looks increasingly attractive as a long-term value opportunity. Well, speaking of value, many investors are worried about lofty valuations in the stock market and whether the Federal Reserve will trigger a correction or possibly even a crash if it attempts to reverse Quantitative Easing. On Wednesday, Fed chair Janet Yellen testified before Congress and tried to downplay the risks of reducing monetary stimulus. Her remarks were received by markets as somewhat dovish on interest rates, with odds now favoring just one more hike this year. Rep. Bill Posey: Can you give me an example that would justify the lack of transparency? Rep. Bill Posey: Well you do if you can't audit it. That's a lack of transparency. Rep. Bill Posey: That's a statement. What do you fear about the audit? Give me a real time example. Janet Yellen: So, I think the FOMC needs a space in which it can have honest conversations. Rep. Bill Posey: So you're telling me we shouldn't be transparent for the fear of being second guessed, or somebody criticizing you because they thought you were wrong? An Audit the Fed bill delivered to President Donald Trump’s desk would be a major victory for sound money advocates. Unfortunately, the GOP Senate is moving forward on legislation at a glacial pace. Senate leaders have postponed the summer recess in attempt to finally bring a healthcare bill of some kind to a vote. More seems to be getting done legislatively at the state level. States including Arizona and Idaho have moved forward with bills to remove income taxation from precious metals. And late last month Louisiana Governor John Bel Edwards signed a bill to eliminate sales taxes on precious metals. Louisiana has now joined 26 other states that do not levy sales taxes on precious metals at all. Eight others include at least a partial exemption on levying sales taxes on precious metals purchases. It’s worth noting that Louisiana’s governor is a Democrat. Bipartisan support for sound money reform is possible to achieve in some cases. Goals such as greater transparency at the Federal Reserve shouldn’t be thought of as partisan issues. Auditing and reforming the Fed and letting gold and silver compete freely with fiat dollars are really populist issues. Sound money is all about taking power away from banking elites and giving it back to the people. Unfortunately, most Capitol Hill Democrats are more interested in falling into line to oppose Republicans and avoid shaking up the system. They like having one of their own in Obama-appointee Janet Yellen still heading up the Fed – and they aren’t about to give the Republican-controlled Congress more say over monetary policy. Maybe they’ll feel differently about auditing the Federal Reserve if President Trump replaces Yellen with a Republican next year. Mike Gleason: It is my privilege now to welcome in Axel Merk, President and Chief Investment Officer of Merk Investments and author of the book, Sustainable Wealth. Axel is a highly sought-after guest at financial conferences and on news outlets throughout the world, and it's great to finally have him on with us. Axel, it's a real pleasure to speak with you, and thanks for joining us today. Axel Merk: Great to be with you. Mike Gleason: Now, as we start off, you recently wrote a piece about complacency in the markets. We are seeing extraordinarily low volatility, and there isn't a lot of interest in safe-haven investments like precious metals at the current time, at least not in the U.S. Axel, talk about why investors may not be showing enough concern and what this complacency says about where we are in the current market cycle. Axel Merk: Yes, sure. And I'll be glad to also link it to why it is that, in that environment, precious metals aren't as quite as much in favor. There have been many reasons given for the low volatility some of them technical, that with more automated trading, that information might absorb more efficiently and theories like that. They might all have a bit of a factor. The main driver in my analysis is the QE (Quantitative Easing) programs of central banks. When central banks print money, so called risk premia are compressed… meaning junk bonds don't yield much treasury. That means peripheral Eurozone debt doesn't trade at much of a premium versus German bunds. That also means that volatility in the equity market is low. And when volatility is low, evaluations are higher. If you think about it, the way you historically value a stock is through discounting future profits, future cash flows. So, when that discounting is done at a lower rate then the valuations are higher. Low volatility means high valuations. At the same time, of course, as you pointed out, precious metals have not been exactly in huge demand in that sort of environment. That is because, hey, future cash flows are safe. Now if volatility goes up, then suddenly you've got headwinds to those future cash flows. An advantage to having gold that has no cash flow is that we're merely discounting that change. So, relatively speaking, when volatility goes up, gold is more in favor. That's one of the reasons why when there's a so-called crisis in the world, gold tends to do well. Mike Gleason: Furthering the point now about how the market may be underpricing risk. Let's talk about what might prompt the next big round of selling on Wall Street. We have the Fed hiking rights and talking about how they're going to start to unwind the quantitative abusing measures that the markets have been so accustomed to. Eventually, you've got to think that the stock markets will respond to that. Meanwhile, there's lots of people worried about China and the potential for a debt crisis there. Here in the U.S., the recovery has been anemic at best and we may even be heading in to a recession – particularly if the optimism towards Trump's plans for tax reform and infrastructure aren't realized. Europe hasn't exactly been fixed. There's a lot going on in the world. What do you think is the next shoe to drop, Axel? Axel Merk: Well, with hindsight I'll tell you which one it was that dropped. And the reason I say that is that when something is not sustainable, odds are it will stop. In my view, it is not sustainable that volatility will continue to be that low. In my experience, and I've been doing this for a few decades now, the best bubble indicator there is is low volatility which is an expression of the complacency. Be that in the tech bubble. Be that in the housing bubble, or be that in the current environment. Now to me, the prime driver of that volatility is the Fed. Central banks around the world. In that context, what the Fed has done on the late, they're pretty much an evil of other central banks to come out of the woods and say, hey, yeah, we can raise rates as well. Then the exact opposite happens when you have Quantitative Easing. You have Quantitative Tightening and that should increase volatility. Now, we may hear of whatever it is… something blowing up in China. Something blowing up with a new political event, or whatever it might be. We'll be glad to blame something specific. But I think the ultimate catalyst is going to be the Fed's moves out of the current environment. That's also, by the way, why the Federal Reserve is always taking kind of one step forward and half a step back. They'll say that they'll engage in Quantitative Tightening, but at the same sentence Janet Yellen said, it's like watching paint dry on the wall. I, wholeheartedly disagree that it's like watching paint on a wall. She puts a damper on the expectations that the Fed is going to get really tough. The Fed is so concerned that volatility is going to surge. And the reason the Fed is concerned about that is because that means that junk bonds are going to plunge in price, and surge in yield. And those are the so called financial conditions that then deteriorate. The Fed isn't so much concerned about the plunging stock market, the Fed is much more concerned about access to credit. But in the current environment, those are sort of the same thing. And that's why the Fed is set to be managing asset prices at the moment. Mike Gleason: For anyone familiar with you and your commentaries, they know you have lots to say about our overlords at the Federal Reserve. You point out that they often say one thing and do another. How do we use that knowledge to our advantage here, and what do you think they will actually do with respect to rates and Quantitative Tightening, and so forth, and how will these markets and the economy ultimately react? Axel Merk: Tough question you're asking me here. What should you do, and what will the Fed do? Ultimately, one of the reasons why we're talking is because we tend to invest. We tend to invest in stocks. In bonds. In precious metals. So what does it mean for investments? I would allege that most investors are overexposed to risk assets. Risk assets are everything from stocks to junk bonds or anything that gives you any decent deal. People have been replacing their “safer assets” with something that yields a little bit more. They're fooling themselves if they think they're diversified by holding these things because the more you go out on the risk spectrum, the more highly correlated it is, quite likely, to equities. Equity has been going up. What you should do is if things go up, you should rebalance. But you don't know what to rebalance to. Many people have been just hoping for the best and it's been working for them. Some people say, for example, at the bottom of 2008, you should've doubled down. Well you can only do that if you took chips off the table so you have something to invest if and when the markets do plunge. But if you lost half of your net worth, or are going to lose half of your net worth in the next plunge of the market, I think that it is completely irresponsible then to suggest that you should double down because you cannot afford to risk quite as much. I mentioned precious metals in the context of diversifying. The beauty about precious metals, gold in particular, is that the longtime correlation to equities is near zero. And as such, it's a diversifier. It's a diversifier and that when volatility goes up, that is something… and I often call it the easiest diversifier, and as those of you who hold precious metals for a long time know, it doesn't always move against the equities. But if you wanted to do a perfect diversifier, you've got to go through some pretty exotic strategies – long-short strategies – that, by design, have a zero correlation to equities and that’s probably beyond the realm of most investors. Now, you asked me the second part of the question of what the Fed will do. The Fed doesn't know what it will do. They made the big announcement about Quantitative Tightening. They don't call it such. They say they want to reduce the sign of the balance sheet by not reinvesting securities, but they don't tell us exactly where they are going to go to because they don't know. They tell is it's like watching paint dry, which it isn't. And I say that because in Europe, they are printing as much, or a little more than they expect to be tightening in the U.S. And they tell you it's a big deal. So, one or the other is wrong about it. Basically, they will continue to high grades and reduce the balance sheet if the market allows them to do it. That's my view anyway. And at the same time, they're very eager to stay “behind the curve.” A key reason why the markets have been holding up is because the Fed has been so extremely reluctant. And so, we talk about hiking rates, but that's on a normal basis. I would allege that on a real basis, there hasn't been any significant tightening because the Fed doesn't want to undo all the “good” that the Fed thinks they have done in recent years. (Former Fed Chair Ben) Bernanke used to phrase it quite explicitly. "When you're faced with a credit bust, you don't want to tighten too early because otherwise the deflationary and forces take over again." Now they think they're over that hump. But still, they're extremely reluctant. And that's one of the reasons why assets prices continue to run away. That said, we have seen plenty of cracks here if you just look at the tech sector for example. Mike Gleason: Switching back to precious metals here. Our view is that the metals markets have grown even stranger and more unpredictable. The advent of high frequency trading and revelations about price rigging are real concerns. We can't be sure just how real these markets are or when they may start reflecting actual fundamentals. We can only be sure, to the extent markets are artificially controlled, that it won't last and go on forever. So, what is your view on the current state of the metals markets, Axel? Axel Merk: When markets sum is priced, you have an opportunity to buy or sell to express your opinion. All markets are in some ways manipulated. And I'm not necessarily talking about some bad guy sitting on a corner trying to pull the strings. It’s really the dynamics of the system that are pushing and pulling in a certain direction. Markets always reflect the future expectations of what's going to happen. That doesn't mean in the future it will reflect the state then. But in the future, they will again reflect the future expectation. That's one of the reasons why, of course, investing is so frustrating. Investing ought to be frustrating. When they're not, when prices go up and up and up, that is when you should get concerned. It's one of the reasons why, in the precious metals market, when things move around that I actually prefer that in some ways over the S&P that goes up and up and up. For in the short term you might look like a genius, but at the end of the day I think you might look much smarter if you have your own view. The thing about these markets that are volatile, and gold has been volatile. It shakes out the weak players. So that means that if you don't have a conviction of what you want and why you want it, you're going to change your mind. You're going to flip-flop and you're almost certain to lose money. Think about the equity market. It's been ingrained now that you've got to buy the dips. Buy the dips and buy the dips ever again. That, in my experience, is not a long-term successful strategy when everybody does it. And there's going to be a lot of crying happening in those markets if and when those markets show an extended period of volatility. A week or two, or even a month is not going to do it, but an extended period of volatility is going to cause quite some carnage in some of those markets. Mike Gleason: Speaking of that conviction, when it comes to precious metals, you have been a precious metals guy for many years and as we begin to close here, I'd love it if you were to share some more of the reasons why you own gold, why you recommend gold, and ultimately why you think it's important for people to have precious metals and exposure to that sector? Axel Merk: Since I started my career I've always looked at ways to diversify portfolios. In the early 90s I invested in tech stocks and diversify to other industries. In the later part of the 90s as the tech stocks went higher, I became more of a global investor. Around 2000, we moved towards cash, international cash, and then precious metals management. Then we got quite a name with what we do in the currency space. It's not that we love currencies so much, but currencies, for example, is a way that you can again get that diversification portfolio. You can take on a currency risk if you're concerned about the dollar without taking on interest rate or credit risk or equity risk, for example. And precious metals, similarly, there's a way that you can diversify your portfolio. I mentioned the low correlation. And the other one is, of course, aside from low correlation, you want to have a positive return expectation. The funny thing about gold is that historically, if you take a longer-term horizon it's got a very respectable performance. It's just that why the heck do you want to own this brick when it doesn't generate any income, but it costs you to hold it? And of course, the answer may well be the alternative, cash, isn’t so great and that's why gold isn't such a bad diversifier. And so, if you look now in the market where “everything is expensive,” the question is where you want to be? I happen to think the traditional diversification models doesn't work. A couple years ago I was quoted that you need to have at least 20% in alternatives. I happen to think now that 20% is way too low. And it doesn't need to be all in gold, of course, but you want to have something that's not correlated. Cash by the way is not such a bad idea either… to accumulate cash as equity prices continue to move higher. The question is how much gold one should hold. As you're probably aware, I cannot give specific investment advice as I'm highly regulated in what I say. But one thing I sometimes say is you should not hold more of anything than you can sleep with at night. And I don't mean that you should sleep with a brick a gold under your pillow. But if you cannot stomach the volatility of what you're owning, then you own too much of it. Beyond that, it's of course up to anybody else. When you talk about mining, you're taking on significantly more risk. The reason I like gold is because compared to many other things in the precious metals space, gold is less risky and serves the diversification purpose quite well. Mike Gleason: Well thanks for the fantastic insights, Axel. It was great to finally get you on and we really appreciate your time. Before we let you go, I would like you to tell listeners a little bit more about your firm and your services and then also how they can follow you more. Axel Merk: Sure. Follow me on Twitter. That's really the best way you can stay in touch. My Twitter handle is my name @AxelMerk. Come to our website MerkInvestments.com. We have a newsletter there. A free newsletter. We talk about macro issues. We have a couple of investment funds including a gold fund. Provide a couple other services so browse around on the website. But if it's just one thing you're going to do, then look me up on Twitter so that we can stay in touch because there you can get the most instantaneous interpretation of the news. Don't just follow me, but follow folks that say interesting things and build your own news channel with that. That's one of the best ways these days, I believe, to stay on top of what's happening. Not to watch CNBC or some of the other programs. News is breaking on Twitter these days so have me on that list and I look forward to meeting you there. Mike Gleason: Well great stuff. Thanks again Axel. I hope we can do it again in the future and have a great weekend. Really enjoyed speaking with you, take care. Axel Merk: My pleasure. Have a good one. Mike Gleason: Well that will do it for this week. Thanks again to Axel Merk, President and Chief Investment Officer of Merk Investments. Manager of the Merk funds. For more information, be sure to check out MerkInvestments.com.